Location is perfect for easy access to the beach, restaurants and bars. Staff are very friendly and helpful. 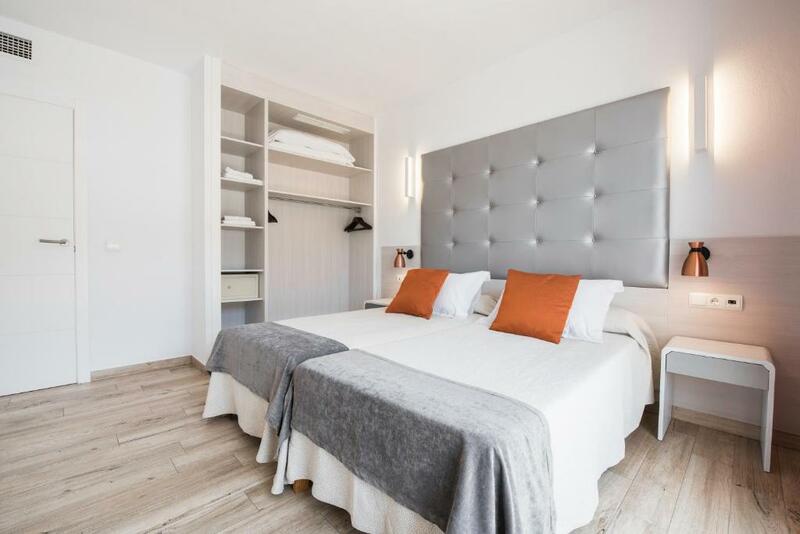 Complex is spotless, apartments are modern and tastefully decorated, housekeeping frequently cleans bathrooms or switch out towels if it’s not convenient when they knock. Bathrooms are modern with great walk in showers. Kitchenette is limited but we managed to cook a simple meal when dinner plans had to be cancelled. Apartments are perfect for 2 adults, a little bit of squeeze but doable for 3 but I wouldn’t like to have 4 in there, presuming the 4th person sleeps on the settee as the sofa bed is a single trundle. There is an on-site laundry and facilities to stow luggage and shower if you have a late flight. Simple menu. Great staff. Good value food. Nice fresh and modern bathroom. The size of the apartment was great. The place was very well equipped. Very clean. I recommend this place if you are looking for a peacefull stay at ibiza. Everything. Shower was amazing! Pool a little cold. Drinks are very reasonable. We went as a family group of 11. The staff are lovely and really good with our kids, nothing was too much trouble! dont understand why its only a 2 star, location for Cala Llonga is really good. Bus service and little land train is over road. Plenty of bars and restaurants in the town its self but if you dont have a car and want to venture out in the evening Santa Eulalia is only €10 in a taxi. They have some amazing restaurants there. Definitely reccommend. Great location, beautiful clean rooms, staff were friendly and very helpful, great value for money. Friendly staff, great location, clean apartment and facilities were good. very kind people at the reception. We had 4 apartments and my parents had a nice apartment on the ground floor as we asked for. Very happy stay at Oasis Sa Tanga! Apartments were very nice and we loved the shower and beds. Really clean. Beds very comfortable. Modern bathroom and shower. 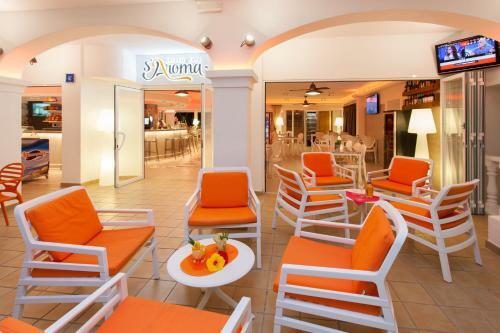 Lock in a great price for Apartamentos Oasis Sa Tanca – rated 8.7 by recent guests! 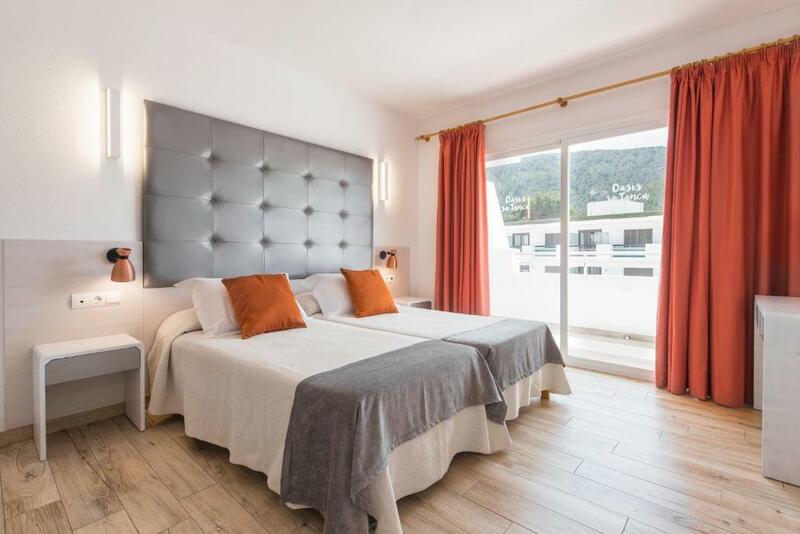 One of our top picks in Cala Llonga.Located in the heart of Cala Llonga, Ibiza, just 150 feet from the beach, the Oasis Sa Tanca apartments have a swimming pool and sun terrace. All apartments have balconies. 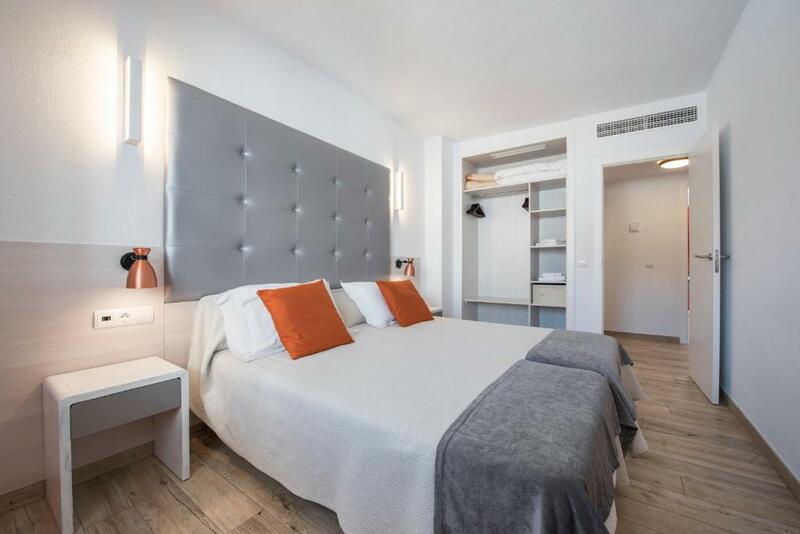 The Oasis Sa Tanca apartments have either 1 or 2 bedrooms, as well as a lounge area and kitchenette. They have air conditioning and flat-screen TVs with satellite channels. The Oasis Sa Tanca offers a free WiFi throughout. There is also a shop selling souvenirs. The Café S'Aroma snack bar has 2 terraces and offers international cuisine, including pizza, curry and tapas. It offers evening entertainment and has satellite TV. The Ibiza Golf Course just 1.9 mi away, while Ibiza Town is about 6.2 mi away. A bus stop can be found just 150 feet from the hotel. When would you like to stay at Apartamentos Oasis Sa Tanca? 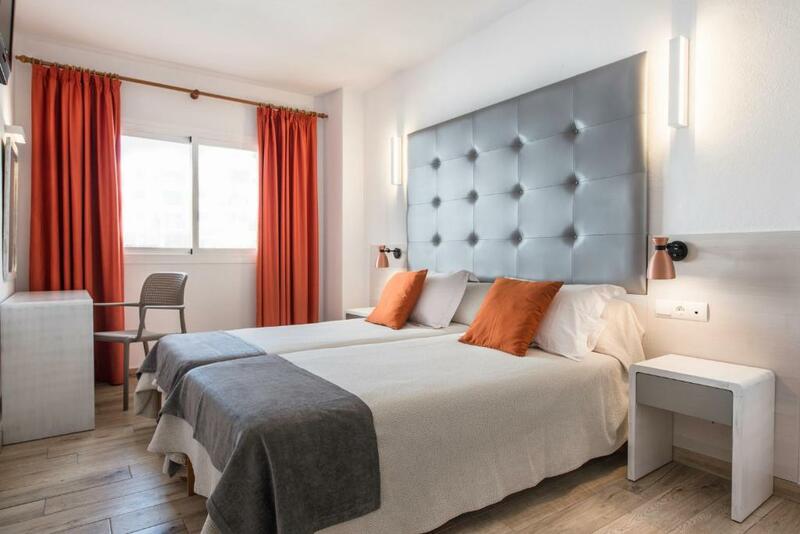 This apartment includes a twin bedroom, a spacious living room including a sofa bed, and a small, fully-equipped kitchen. The apartment has a terrace. This apartment has 3 balconies and includes 2 twin bedrooms, a living room with a sofa bed, and a kitchen including a breakfast bar. 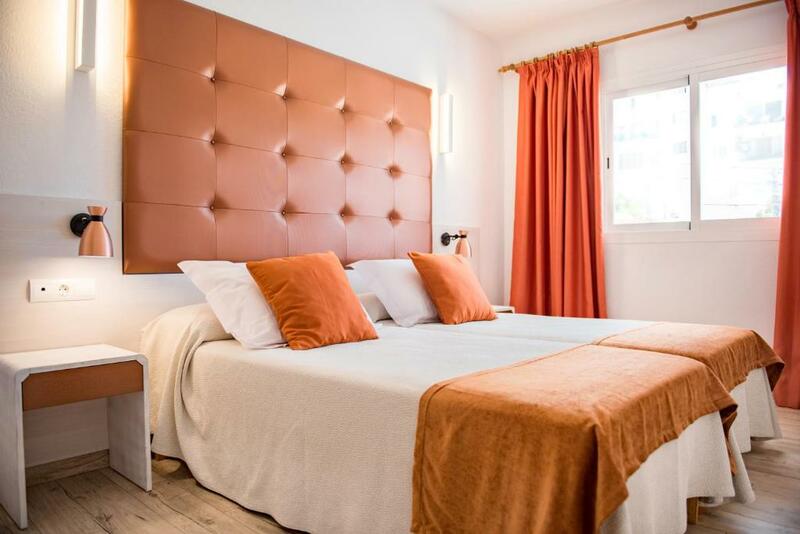 Located in the heart of Cala LLonga, Ibiza, just 50 metres from the beach, Oasis Sa Tanca has a nice pool with children's section and solarium. There is Free WIFI access in all the hotel and calls service in reception. In the same building our guests can find a supermarket and souvenirs shops. House Rules Apartamentos Oasis Sa Tanca takes special requests – add in the next step! Apartamentos Oasis Sa Tanca accepts these cards and reserves the right to temporarily hold an amount prior to arrival. Please note that room cleaning and changing of towels will be done twice per week. Sheets will be changed once per week. Please inform Apartamentos Oasis Sa Tanca of your expected arrival time in advance. You can use the Special Requests box when booking, or contact the property directly using the contact details in your confirmation. Only thing was the floor in apartment could have done with better clean. However I did it my self, but if id of told them they would have happily done it. more breakfast possibilities, although we loved the cocktails made by our barman/woman. The noise! I asked if you could help but you did not react. The staff. They could not make decisions themselves so I had to be very patient. I could not sleep until 5 am for 5 nights.... When I convinced them of my delema they moved me to the other side of the building. I feel you should refund me for the first 5 nights. I was too tired to do much as I was so exhausted. Disability access is not great, there is no disabled parking near the hotel, there is limited on street parking outside the hotel but the overflow parking is in the wasteland across the road and that was full at times too. There is a stair lift to some apartments but otherwise there are stairs between the lift and all other apartments. Noise! Road noise was much louder than we expected. We visit Cala Llonga regularly and when walking along, the road did not seem that busy hence why we went ahead with booking but it actually is so much noisier once you are in your apartment! The complex is noisy due to so much tile and the echo that seems to exist due to buildings behind, it amplifies any noise on the walkway like doors banging. If there are high spirited guests in the bars/ restaurants behind, it can be noisy in your bedroom until 2am, didn’t bother us but thought it should be mentioned for others to know about. We didn’t use the restaurant downstairs as they were closing when we arrived at 23.30 and we’d heard that it is not so good over recent years. Would have liked some kind of canopy over balcony to shade balcony from the afternoon sun. Bed and shower were great. This is important for us. Lovely clean modern apartments. Nicely equipped kitchen. Great shower with hairdryer. Staff are very friendly and helpful. You also have free WiF and TV in the lounge and bedroom. Nice restaurant for breakfast ,lunch and evening meals. Two minutes to the beach. All in all we would happily stay here again! Highly recommended! The kitchen didnt have much storage and I would have a appreciated soap in the bathroom. It was quite pricey for a week, but hey, this is Ibiza!